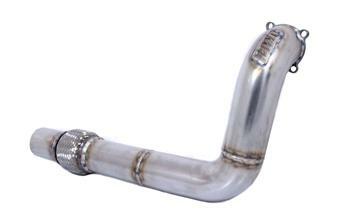 BWR Downpipe - Dezod Motorsports Inc - Home of the automotive performance enthusiast since 2002. Blackworks Downpipes are Made from high quality Stainless steel, and Precision TIG Welded for quality. Our Downpipes are made from 3” OD mandrel bent tubing to support your high horse power level with a re-enforced high quality Flex Section. Hand Made In The USA! !